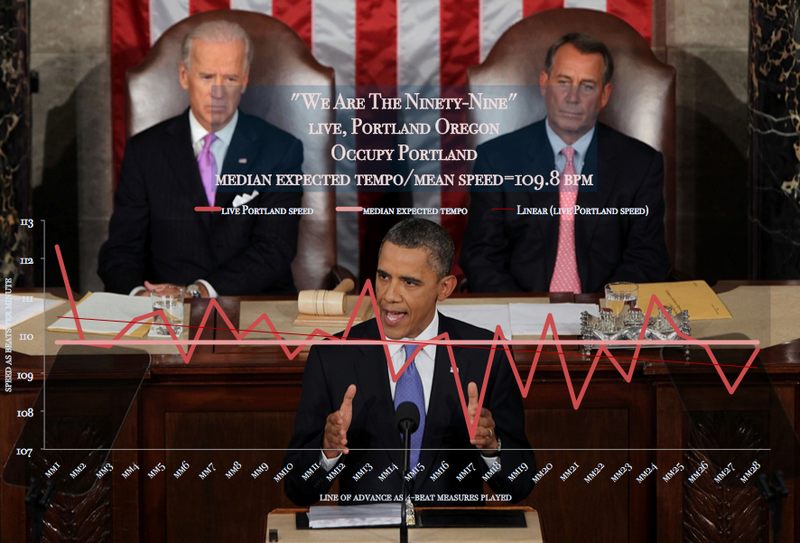 Tempo of the ‘Occupy Portland’ Protest Chant | How real is this ‘city’? I listened to it a few times, and like many of you got the song stuck in my head. I gave myself a miniature earworm – a tape loop that won’t leave the memory. 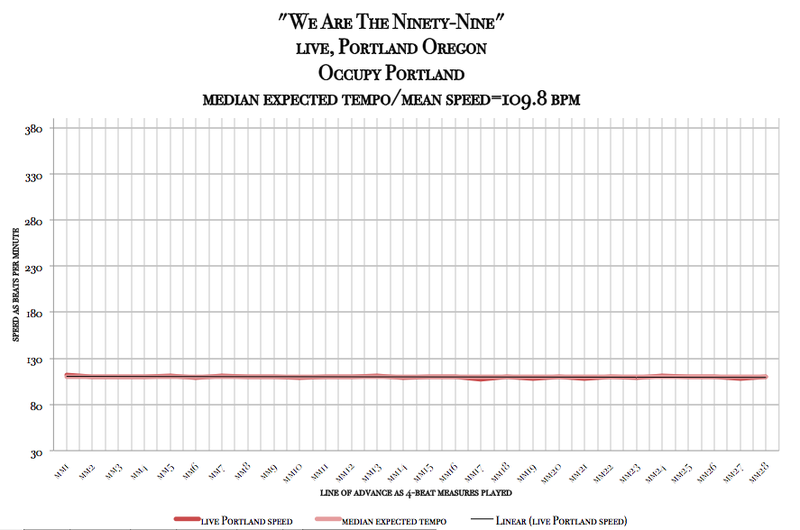 Using Meanspeed Therapy, I measured the song for speed, and as can be seen in the charts, the average speed of the protest chant is 109.8 beats per minute. Next I consulted my tempo catalog of songs. 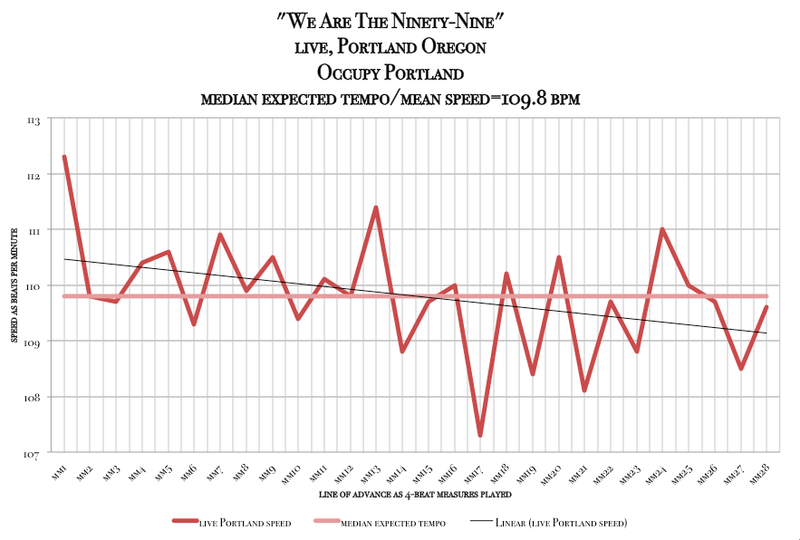 Within 1% of 109.8 bpm, I found PURPLE HAZE by Hendrix, MISS YOU by the Stones, POWDERFINGER, live on Live Rust by Neil Young and Crazy Horse and STAND by R.E.M. I sang on top of the sound as played, and then as just played in my head, et, voilà! 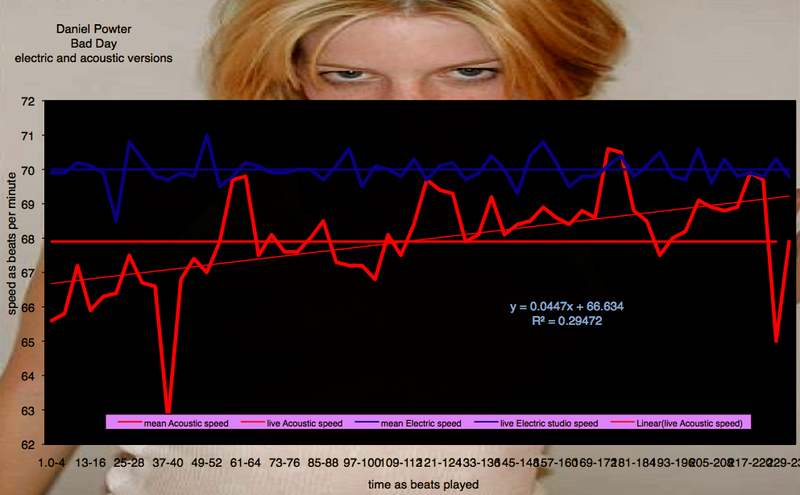 Earworm gone, I changed my groove from about 110 beats per minute to one that I felt today, 65 beats per minute. No big deal? Huge deal. Had I not knocked that right out, I’d still be bothered by it now. IN fact, I heard it so many hours ago when I just replayed it to check it for this post, I could barely remember it and it did not bother me at all. Very easy, very cool, right at your desk. And no, please no more emails about “registering for the site.” Everyone gets to see the same things unless I work with them privately. 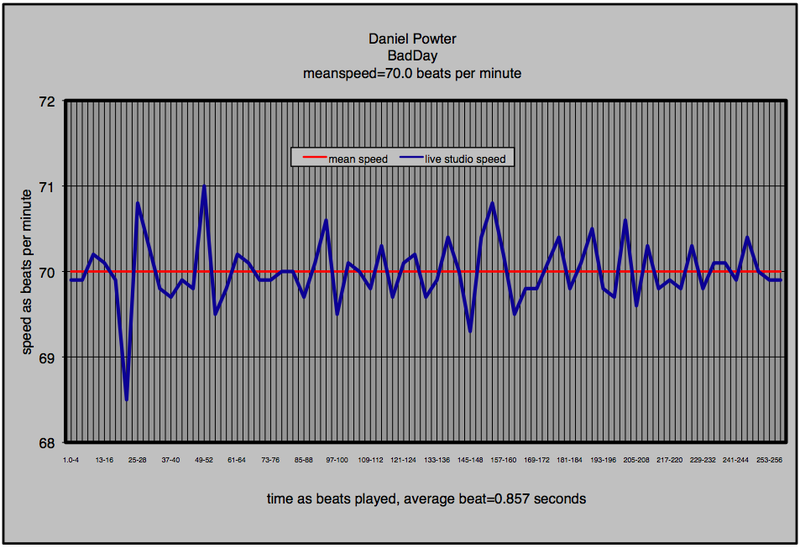 IN 2006, Danny Powter had the most famous one-hit wonder song ever to become property of the National Football League called BAD DAY. “Bad Day” is a pop song written by Canadian singer Daniel Powter. It was released as the first single from his second album Daniel Powter (2005) and achieved a huge success throughout the world, reaching the #1 spot in the U.S. and Ireland. In the U.S. it was a massive smash hit, and became the most successful single of 2006 as ranked by Billboard Magazine. It was also used in the opening sequence of the movie Alvin and the Chipmunks, where the chipmunks were singing the song as they stored the nuts for the winter. “Bad Day” was used as the 2005 ‘Goodbye Song’ in the fifth installment of the hit show American Idol. 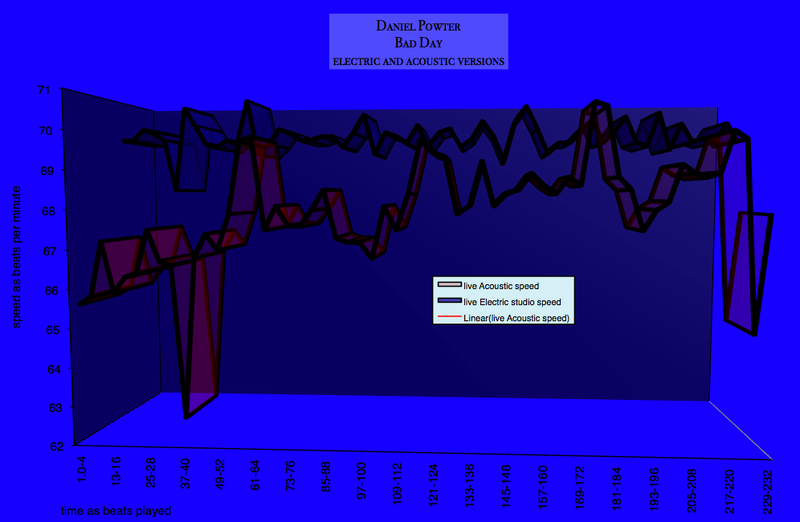 Despite the song’s massive worldwide success, Powter failed to release any more pop hits, proving to be a very successful one-hit wonder. The boy and girl in split screen from the music video. The music video is directed by Marc Webb and features two single people, a male (Jason Adelman) and a female (Samaire Armstrong), waking and going about their daily schedule. The video shows this happening over a three-day period, but makes no distinction between the days apart from the different clothing worn for each day. The main event is the two adding graffiti to the same wall, separately, on each day, culminating in the completion of a heart. At the end of the video, life mirrors the image created on the wall, with the boy offering the soaking wet girl a red umbrella in the pouring rain, as a cab stops for them. Parts of it are shot in a split-screen. Throughout the video, Powter is shown with his tuque, playing his piano. The Metro Red Line subway in Los Angeles was used during the shooting of this video and prominently featured throughout. The area where the two meet and add the graffiti on the wall is on the mezzanine level of Pershing Square Station in Downtown Los Angeles. Billboard called the song “one of the great discoveries of the year” and the top One Hit Wonder of the 2000s. “Bad Day” reached number seven on the Canadian Singles Chart; it was also successful in the United Kingdom, where it reached number two on the UK Singles Chart after it was used in an advertising campaign for Coca-Cola. In the United States, it reached number one on the Billboard Hot 100. The song grew in popularity in the United States when it was used in the fifth season of American Idol in the farewell video packages for eliminated contestants. It was also featured in the compilation album Voices from the FIFA World Cup during the 2006 FIFA World Cup. 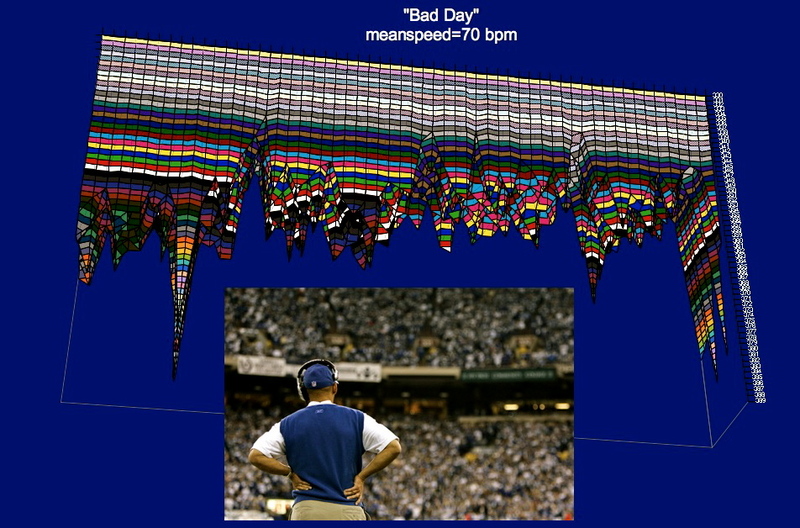 It is also currently a popular song to play in sporting events, usually whenever the home team loses. It was even played after the 2008 U.S. Presidential election after John McCain’s concession speech. “Bad Day” has been certified 2x platinum by the RIAA in the U.S. for digital sales of over 2 million. The song was featured as a free download on the iTunes Store from August 2–9, 2005. It was nominated for a 2007 Grammy Award for “Best Male Pop Vocal Performance”. Billboard named “Bad Day” the No. 1 Hot 100 song of 2006. It is one of three “one hit wonders” to become Billboard’s single of the year, following 1958’s “Volare (Nel Blu Di Pinto Di Blu)” by Domenico Modugno and 1962’s “Stranger On The Shore” by Mr. Acker Bilk. On the 16th July 2008, it was revealed by BBC News that “Bad Day” was the most played song in the UK during the period 2003-2008. “Bad Day” was covered by the fictional music group Alvin and the Chipmunks for their 2007 film Alvin and the Chipmunks. Their version made the charts in January 2008, debuting (and so far, to date) peaking at #86 on the Billboard Hot 100. “Bad Day” was also covered by Kidz Bop, also the first Kidz Bop song to be a single. Sounds Of The Times – Green Day, Phil Collins, Dave Matthews Band declassified harmonic tempo probabilities. 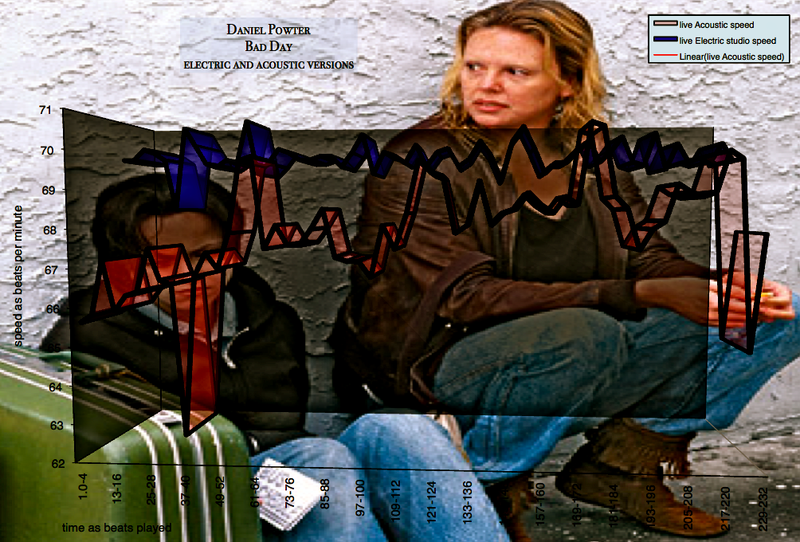 People are struggling – and instead of FIGHTING for tings, it os time to work on SOLVING problems or just taking it slower – a great message issued by the Governor of Ohio during the 2016 election that people ought to think about. Frankly, I was surprised to hear such wise advice from this candidate.